GetDiscountApp cannot give you any discounts, because this browser extension is completely useless, and by keeping it installed on your operating system you will only put your virtual security at risk. You should consider TakeSave, GetIt4Cheaper, Free2you, and all other programs built using the Justplugit engine to be equally as unreliable and deserving of removal. Unfortunately, you need to remove GetDiscountApp, and the sooner you get this task out of the way, the sooner you can take care of your virtual security. According to our recent research, GetDiscountApp is an old application. In fact, it is so old that even the website (getdiscountapp.info) used for its representation is no longer active. Unfortunately, this does not mean that the program is no longer spread and that users do not need to delete it from their PCs. You might install GetDiscountApp by accident when downloading old software bundles promoted by Installrex or Amonetize. This, of course, does not mean that the program is no longer active. In fact, you must remove it ASAP. GetDiscountApp is composed of files that enable communication between your browsers and remote adware servers. If you remove these files and disable the communication, you will not have to deal with the advertisements flooding your browsers. Plus, these ads cannot be identified as reliable or useful. Ignore the offers and the deals promoted via these ads, because they are set up only to trick you into interacting with as many pop-ups and banner ads as possible. This is how the developer of GetDiscountApp earns his money. Our malware researchers warn that clicking on these ads can be dangerous, and so we recommend removing this adware from your operating system. You should not consider the removal of GetDiscountApp to be an easy task until you analyze your operating system and learn what other threats are active on your PC. 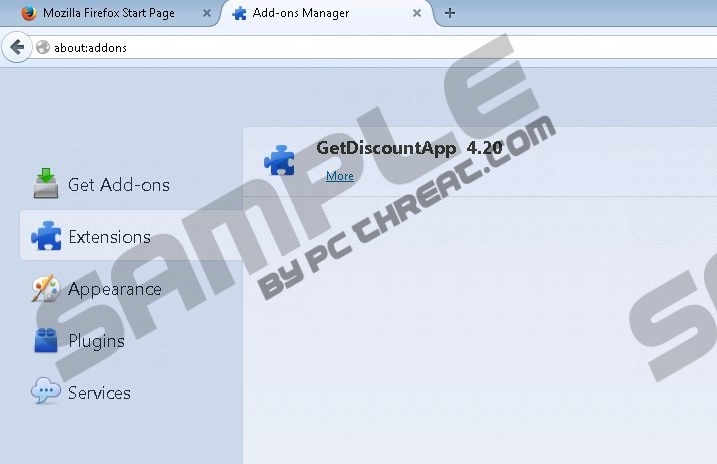 Unfortunately, if you discover that you need to delete adware helpers associated with GetDiscountApp or other infections, including browser hijackers and rogue malware scanners, you might find the removal of adware to be quite complicated. You have to be particularly cautious if you decide to delete GetDiscountApp manually. Keep in mind that if you do not remove all components of this program, the intrusive activity could continue. If the manual removal of GetDiscountApp is too complicated, you should employ a tool that will delete the ad-supported program and ensure full-time Windows protection automatically. To download the automatic malware remover SpyHunter, click the download button and follow the given instructions. Find the Taskbar at the bottom of the screen and click the Start button. Open the Control Panel for more options and double-click Add or Remove Programs. Select the undesirable application and Remove it from your operating system. Find the Taskbar at the bottom of the screen and click the Windows button. Open the Control Panel for more options and click Uninstall a program. Simultaneously tap Win+R to launch RUN (works from Metro UI and Desktop). Enter Control Panel to open the menu and click Uninstall a program. Quick & tested solution for GetDiscountApp removal.